The Network Clock is primarily used to clock in and out. 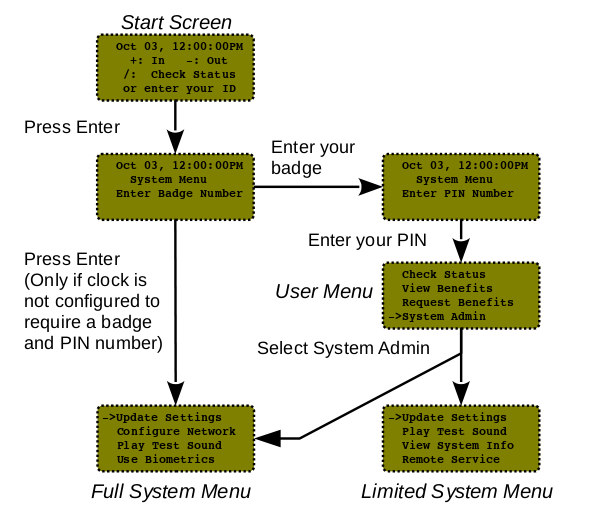 The clock also offers a System Menu which can be used to configure the device and access other functions. This article outlines the Menu options that are accessible. On a new clock (or a clock that has had "Reset to Factory Defaults" selected), the screen and menu are different. For assistance with the initial configuration of the clock, please consult the Installation Guide for the model of clock you have and/or contact TimeIPS technical support. Select "Apply Settings" to apply network changes. Safely shutdown system to disconnect from power? Shutting down, safe to unplug in 15 seconds. Configuring Attached Devices... Please wait. From this screen, it is possible to access the System Menu. Simply press Enter without entering a Badge number. Press Enter again without a Badge number. Remote Service has been enabled. Num Lock warning is currently enabled. Check for updates? Clock may restart. Erase all data and settings? Clock will require new setup. Enter a Pin and hit Enter (or just hit Enter again if a pin has not been set up). Vacation, Sick, and any other benefit types configured in the TimeIPS server. 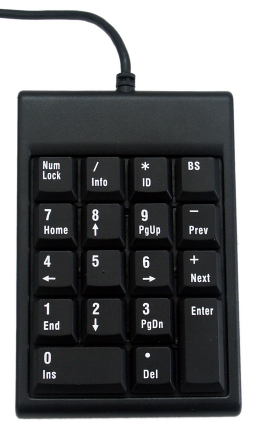 ENTER Enter Key Used to select options and navigate through the menu/system. BS Backspace Used to remove last typed character in case of incorrect entry or returns to the previous menu.